In the Cleveland area, it’s common to discover that wetland conditions in some form may affect your project. As you invest in property and move forward with its development, you will likely encounter one of the four main types of Ohio wetlands: freshwater marshes, bogs, swamps, and fens. What should you do if your project involves wetlands? You might need to partner with wetland consulting services to ensure the success of your endeavor. If you think you may need to hire these professionals, take the following three steps. Are you planning a project that may alter a stream, wetland or other water body? Would you like to avoid impacting a wetland with your proposed project? Once you determine that you need wetland consulting services, your next step is to explore the various services available. This partnership will have a significant impact on your project, so it’s important to thoroughly investigate your options and choose the best service provider available. As you consider various wetland consulting services, look for those who offer these six essentials. Comprehensive Assessments: Your wetland consulting services should provide comprehensive reports of the property to ensure your efforts meet all standards and you are fully informed to make decisions about your project. This requires that the company complete extensive research, offer attention to detail, and refuse to cut corners. Local Experience: While you want to choose a company that has experience, longevity in the industry is not enough. Look for someone with relevant experience in the region. Knowledge that is specific to the unique environmental conditions of the Cleveland region and Ohio wetlands can provide valuable insight. A local service can also provide in-person meetings and expedited services if needed. Complete Solutions: As you launch your initiative, it is difficult to know exactly what wetland consulting services you will need throughout the project’s completion. A company that is great at initial evaluations but is weak in the area of mitigation might fall short of meeting all of your ultimate needs. Look for a company that is proficient in all areas of environmental services, who can partner with you from start to finish. High Approval Rates: Research each company’s track record of success. How many of their projects receive approval? Do they offer proven methods? Find a company that offers a solid approval rating, since they are more likely to achieve the results you desire. Industry Reliability: Keep in mind, you get what you pay for. A search for the lowest bidder among wetland consulting services won’t get you the precision methods and detailed reporting you need for a successful project. Look for experience, high quality, and reliability over “value” pricing. Savings that you initially enjoy may cost you down the line. Top Qualifications: Not all wetland consulting services are created equal. Some offer highly qualified professionals. Some don’t. Choose services that are provided by certified individuals, sediment experts, environmental specialists, and other fully-trained consultants. We prepare detailed and comprehensive reporting as standard practice. Our team leverages more than three decades of experience in Cleveland, OH to provide unique insights based on local knowledge of the region and its wetlands. 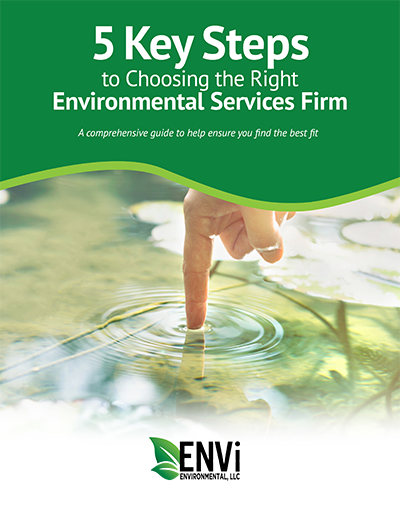 ENVi Environmental’s ENVi 360™ Solution includes the full spectrum of wetland consulting services to meet the needs of complex projects from start to finish. We offer consistent, detailed methods that result in a high approval rate for the projects we submit to regulatory agencies. ENVi Environmental personnel include qualified professionals who are certified and specialize in erosion, soil, sediment, asbestos, hazardous waste, and OSHA training. Contact our team today to find out more about our wetland consulting services and how they can benefit your business.